Bronze is an alloy consisting primarily of 80% Copper commonly with about 20% tin. Bronze is typically very ductile alloys. Bronze also oxidize as it is a mixture of copper tin and it need to be cleaned in every 2-3 days to preserve its shining like brass/gold. The primitive man started drinking water from his cupped hands. Fine Decorative Bronze Handmade Singing Bowl Buddha Design Available In Different Designs & Sizes. Banking on our enriched industry experience, we are able to supply Bronze Bowls. Backed by our rich industrial experience in this domain, we are committed towards offering an excellent range of Flat Bottom Serving Bowl. We are engaged in offering Bronze Bowl. 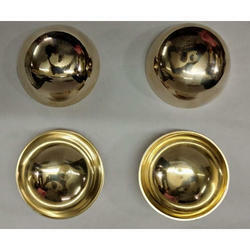 We are a top notch supplier of Bronze Bowl. Almonds 400gms + Cashews 400gms. Swati Dry Fruits Pvt. Ltd.
For Puja, Body Massage, Head Massage, foot massage.For external use only. Pure Kansa Bronze metal. this is made by bronze. katori comes in sizes 4", 5", 6" etc. 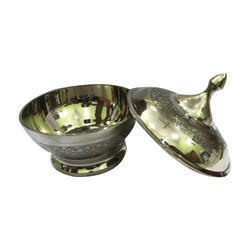 we can sell katori with or without silver plating as well. the price is negotiable with quantity. transportation cost is bear by buyers. We are a top-notch organization, engaged in providing Bronze Bowl.